One of the most interesting and the most frustrating factors in the study of early Greek coinage is that solid facts are exceedingly difficult to find. When you examine long-standing assumptions about certain aspects of coinages, you often discover these assumptions have the solidity of a bowl of Jell-O. Oh well, it’s all part of the fun of collecting. So I was under no illusions when I bought a rather large coin of the Derroneans. Naturally, I decided that I had to find out as much about the coinage as I could. We actually know very little about the Derrones or Derroneans. We are not even certain of their precise location. They seem to have been somewhat north of the Bisaltii in the upper Strymon valley, which would place them in the modern Republic of Macedonia or southern Bulgaria. Others theorize that the tribe was further south and much closer to the coast. 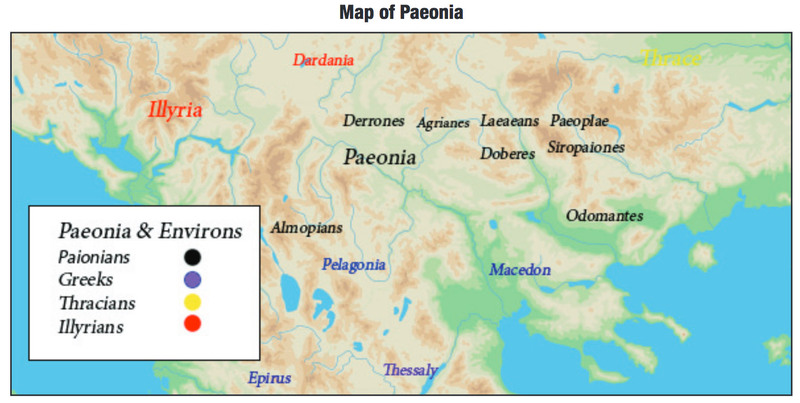 They were likely a Paionian people though one source suggests that they were Thracians. Legend has that the Paionians were allied with the city of Troy during the Trojan War. My coin depicts a man driving a chariot being pulled by an ox. No need for speed here. The male is depicted bearded and wearing a kausia which on this specimen is rather indistinct. He is cracking a whip using his right hand while his left is presumably holding the reins. He is wearing a long and rather shapeless tunic. The chariot is depicted with a rather odd wheel which looks like the letter H sideways. This may indicate a solid wheel. Similar wheels can be seen on the Royal standard of Ur which was made some two thousand years earlier. The sides of the chariot are denoted here by an “X” shape and are thought to represent a wicker structure. Above is a rather large Corinthian style helmet, a symbol often seen on these coins. There are a number of interpretations as to what is being depicted. Most seem to think that either the king or the high priest is driving some form of ceremonial or sacred vehicle. One interesting theory is that the figure is some local deity who had lordship over domesticated animals. He could be a version of Hermes, the messenger of the gods, or possibly the god of cattle rustlers which is an aspect he shares with the hero Herakles. Cattle rustling is not a new phenomenon, and is a necessary step towards manhood and marriage in some pastoral cultures. The helmet could represent his association with Ares the god of war or perhaps simply a piece of required equipment for a bit of bovine five finger discount. Any of these interpretations could be true. This coinage comes in three distinct groups. In the first group, the name of the people ΔERRONIKON is usually engraved retrograde on the obverse of the coin. In the second group, the first three letters of kings or magistrates are engraved there instead. On my coin, the letters ‘Π I E’ are shown retrograde, spelling ‘PIE’. It is at least the sixth known coin of the type. Given that these coins were minted only briefly, I think the letters represent a magistrate or the best cattle thief for that period. The third group is completely anepigraphic, that is, with no inscription whatsoever. My coin is on a fairly broad flan, though it is very irregularly shaped. The reverse features a triskeles of human legs running to the right and set in a shallow oval, and like most of these large coins it is not fully struck up and it shows some evidence of double striking. It is clear that the celators at this mint had a number of problems striking these coins. One of the features of this coinage is the wide range of weights. The heaviest of this particular series seem to be around 40.70 grams, the lightest around 28.15 grams. The ‘PIE’ issue has a weight range of 36.94 grams to 34.47 grams. The numbers are too small to come to any definite conclusion, but on this group, as well as on one other that I could study, the weight range is relatively small. This might suggest a series of weight reductions, however the issue period from 475 to 465 B.C. seems rather too short a time for that. Which brings us to perhaps the most vexing issue of all: what was the purpose of this coinage? One of the more unique features of this early coinage is the range of large denominations created by the cities and peoples of the region. While cities elsewhere were minting their smaller coins, topping out at a didrachm of about 8.6 grams starting circa 520 B.C., the city of Abdera was striking coins of oktodrachm size. The Derroneans seem to have followed suit with both dekadrachms and dodekadrachms starting circa 500 B.C. Later, circa 475 B.C., the Bisaltii started minting oktodrachms. Meanwhile, the Macedonian king Alexander I seems to have begun to mint his own coins sometime around 492 B.C. 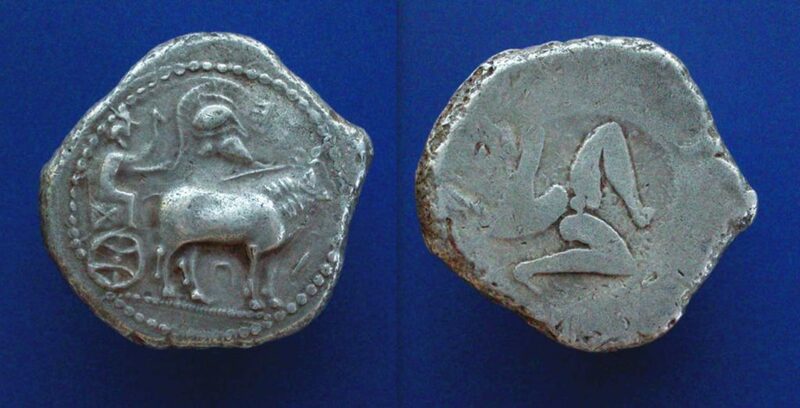 and all of his coins were minted on a weight standard more or less indigenous to the region, the so called Thracian-Macedonian standard based on a didrachm of roughly 7.4 grams. There is some scholarship that suggests that the large Derronean/Thracian coins were part of a tribute payment to the Persian Empire. This seems unlikely. While it is possible that the coins of Abdera and Alexander I might have been part of this system of tribute, the heavy coins of the Bisaltii, most of the Derronean and even much of the Abderite coinages were minted after the collapse of Persian dominance in this region. 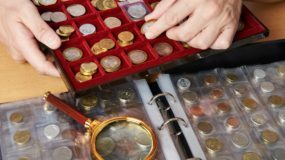 Another possibility might be the desire to create large denomination coins for commercial purposes. We have seen how the Kyzikos electrum stater seems to have defied its rather problematic choice of metal to become a well regarded trade coin. This might have been the impetus for others in the region to strike large denomination silver coins. They may have been seen as a bit of a marketing tool, making their silver coins desirable to a wider market. In the modern silver bullion market, certain items such as the Canadian Maple Leaf are considered more desirable over silver from other sources. Thus they command a premium. One has to wonder if, for example, the rather universal Athenian tetradrachms commanded a similar premium in Syrian or Egyptian markets. 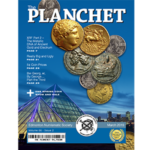 Of course, the short answer is we simply do not know, although we do know that their coins had wide acceptance since the vast majority of coins found in Syrian and Egyptian hoards are Athenian tetradrachms. 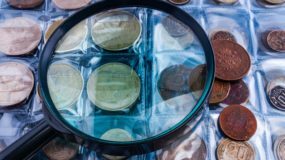 If the plan was to create very large coins to make them more acceptable to outsiders, we have to assume that it did not meet the expectations placed on it as the series was quickly discounted. It seems to me that the pro-duction of these massive coins must have satisfied some internal need of the Derroneans and that any benefit derived through trade was most likely a byproduct. True, the coins of the Derrones are also found in Egypt and southern Turkey, but there is no real way of determining any direct contact. Once the coin left their territory, it could have ended up anywhere. Which brings us back to our original question. It seems odd that a society made up of essentially small farmers and ranchers would feel the need to produce these massive coins. It seems more likely that the coinage was ceremonial, perhaps some form of gifting event. During such an event the king or some other leader would give valuable gifts to his most important supporters at some form of ceremony. In this case, the weight may not have been the most important thing compared to perhaps the number and size of the coins. This might explain why the overall weight standard appears to drop over time and the individual issues seem to form rather tight weight groups. So what have we got thus far? In this case we have a large heavy coin which we know is from the Derrones, but we know very little else. Regardless, it would seem that the coinage died out within a few decades of it being started. Why this occurred is also unknown. Something may have happened to disrupt the Derronean’s access to silver. This may also explain the confusion as to their precise geographic location. They may have been forced to move, and lost their easy access to silver. However, it should be noted that we have no real clear rationale for the existence of this coinage and therefore what factors led to it being initiated, why it didn’t last, and why the coinage was discontinued.